My name is Ivan Menjivar, a Salvadoran-born US citizen. My US-born wife and I used to live in Washington, DC, where she was deeply affected by the electronic pollution caused by the high levels of surveillance that crisscross the city, exponentially increased after 9/11. We own property in PA, were looking into building a non-traditional house, started inquiring about architects, when a common friend of EcoNest’s Paula Baker-Laporte and my wife Janet, suggested we contact Paula. Fast-forward a long Google search, my wife found Paula comfortably nestled at EcoNest, and earlier this year we went to a one-day seminar in Ashland, OR. Besides many other EcoNesters at the seminar, we met Bobby Ilg, a Canadian architect greatly interested in the EcoNest concept, who was hosting a workshop for EcoNest this past August, in order to build his house. My wife and I realized we couldn’t both go, one of us had to stay holding down the fort (one of our Rotties has lymphoma), and I signed up for the seminar to be held in Ottawa, Canada. I was prepared for cold (mindset, Canada=cold), to my surprise, Ottawa was hotter than El Salvador, where we currently live, and more humid, perfect for outdoor work. I was confused at the starting date, arriving a few days earlier, being the first student at the workshop (an “eager-beaver,” Robert called me. :-) The house foundations were not ready yet, a basic piece without which we couldn’t have a workshop; at the same time that delay provided us with an “added bonus” to see the house built bottom to top (every crisis is an opportunity.) With the foundation finished, we moved on to timber framing, spending a couple of days learning to sharpen our Japanese tools before getting to use them. As the WS developed, I realized I had been given a privileged opportunity to share a piece of life with Robert, whose teachings went well beyond natural building. Essential to the WS is the creation of a social environment among the students, so the WS sails through a tapestry of community-based effort. We are all there to learn, we are all equal under Robert (no joke), men/women, black/brown/white, big/small, tall/short, and we are all assigned tasks according to our experience/abilities. Learning goes quickly, as it is passed around from Robert to the group, and from the most experienced to the green ones. Most mornings, except the few times work demanded it, we started with a check-in on our physical/emotional state, stretching and exercising. Robert’s cardinal rule is “take care of yourself,” which translates into being extremely careful while at work, be present, be mindful, hydrate (brain works better hydrated, Robert’s mantra), take care of the work site (no nails/screws on wood scrap), safe tool handling, etc. My WS mates were mostly females, most of them students of Interior Design at Algonquin College, Ottawa, with some builders/carpenters or simply fans of the EcoNest concept who traveled from the US, most of us green in building/construction experience. It was greatly satisfying to see the results of our job becoming part of Bobby’s house, while learning why precision and attention to detail are essential in timber framing. Assembling the timber operation can be delayed for a piece that doesn’t fit correctly, stopping the crane and the entire crew while Robert chisels a feeder to set it into place. Once the entire timber framing was done we moved into panel and clay straw production, the walls elements. Robert’s system (for this WS, I can’t speak for others), was to divide us into teams, with 10 seconds to choose a team name, each team setting up a working station for production, building and assembling of all the pieces (e.g., panels, clay straw storage) needed for the wall panels. Once built, we moved into filling them up with clay straw, closing them with straps, leaving them ready for pick-up and installation. It was gratifying to see our job, again, becoming the walls of Bobby’s future house. Installation day came with a crane, and same with the timber framing, it went without a hitch, all panels falling into place, a few of them with last minute adjustments required by Bobby’s engineer. The WS was coming to a close, and the day before (Thursday), a few of us went to a Canadian diner for a treat of Poutine, without which we couldn’t leave Canada. Final day, Friday, Robert gathered us all in a circle, where he asks everyone to tell a quality that sums up their experience with whoever is leaving. Personally, it was a very emotional moment, I became teary-eyed, and I couldn’t understand why. Once home, while preparing my bags, I understood. From the circle where we stood toward the end of the EcoNest WS on a street in Ottawa, in a beautiful late summer afternoon, while standing at Bobby’s house frame, which I had helped building with my own hands, I could see my EcoNest house adorning the rolling hills of Pennsylvania. Click here for pictures of the workshop in Ottawa. The farm hosts a yearly event, Sufi School East, and has the facilities to accommodate a large number of people, ideal for an EcoNest workshop. There is space for camping (see for yourself), a large barn remodeled for sleeping quarters, and kitchen facilities. We have plenty of lambs, and for those who are not vegetarians, we promise to have a lamb feast at the end of the workshop. Everyone is invited and will be warmly welcomed to take part in the building of our EcoNest house, a one in a lifetime experience. 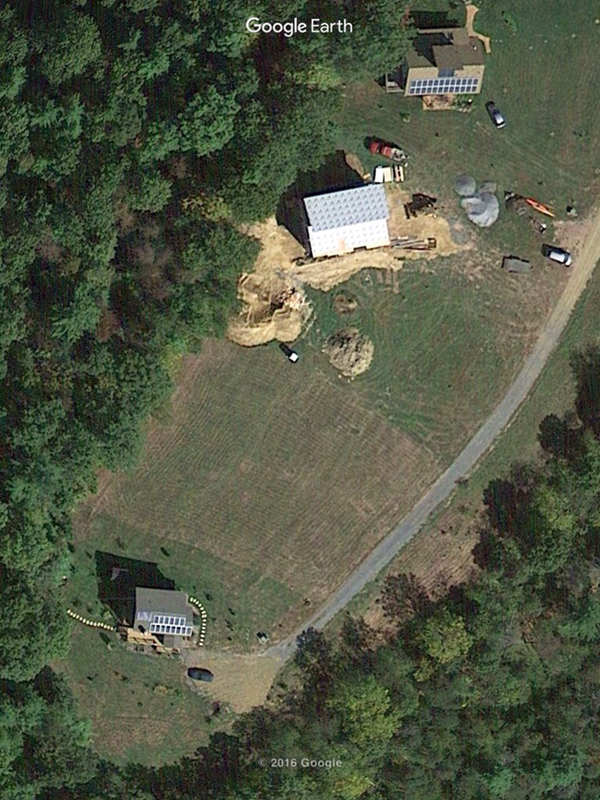 Below please see a picture of our lot at the Farm of Peace. Ours is the empty lot in between the already built house (bottom left) and the in-construction white straw house (top, right-of-center), already finished by now. We are building forward toward the service road on the right. I’d like to express my gratefulness to all who made this workshop experience possible. First of all, I thank Allah for showing us the way to EcoNest and natural building. Paula’s friend who lead us on her direction, Rahima Schmall, is also a Sufi, a professor at the University of Spiritual Healing and Sufism, where my wife has worked until recently as a teacher assistant. I thank Robert Laporte, a master builder and teacher, pioneer of biological building in the US and Canada, for helping me bridge the distance between the dream and the real possibility of having a natural house. His support all along, and his patience answering all my questions, made my participation in the WS a positive learning experience. I thank Paula Baker-Laporte for sharing her broad knowledge on natural building applied to the concept of EcoNest. Also, I’d like to express my gratefulness to Kyle Little, assistant to Robert during the workshop, for his mindfulness, patience and camaraderie during the entire workshop. I certainly hope Kyle will be part of the managing team that will build our house. We will do our best to make sure that is the case. I’d like to thank Bobby Ilg for hosting the WS, and to his extended family for feeding us delicious Lebanese food, specially prepared by Bobby’s mother-in-law. I extend my thanks to all Canadians I met, a wonderful, happy people, who showed me the meaning of friendship.